Xilisoft iPhone Ringtone Maker 3.2.12 Portable » SoftLab-Portable.com - Portable Soft! Now create your own ringtone from your favorite music or video without ever buying from iTunes Store! Virtually all video/audio formats are supported - AVI, MPEG, WMV, DivX, MP4, H.264/AVC, AVCHD, MKV, RM, MOV, XviD, and 3GP plus audios like MP3, WMA, AAC, WAV, RA, M4A, and AC3. With the smart iPhone ringtone maker, you can even transfer the converted file directly to your iPhone without going through iTunes. 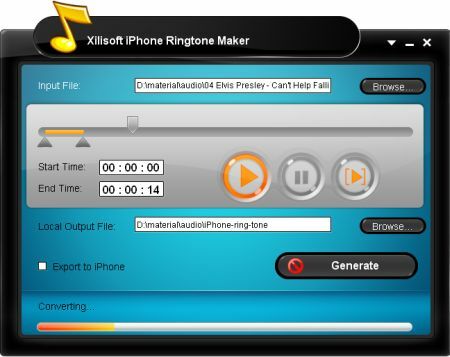 Use Xilisoft iPhone Ringtone Maker to clip a segment of an audio or video file and set it as your ringtone. Try our software now, so you can start personalizing and assigning ringtones for select contacts or groups in your iPhone! Please register or login to get full access on our site!